You will be comfortable in light clothing especially during summer. What if I have never danced before? If you can walk, you can dance. �The teachers walk through the basic steps each week, and all dances are broken down and walked through first at class. What if I don't have a partner? What footwear do I need? Wear any shoes that are comfortable that don't stick to the floor. Do I have to be Irish? No, you don't have to be Irish to learn Irish Set Dancing. �Irish Set Dancing has had a huge revival in Ireland and is enjoyed all over the world such as Canada, Japan, Spain, America, Englad, Belgium, Russia, France, Germany, Switzerland, Denmark, Italy, Czech Republic, Argentina,New Zealand, & all over Australia. 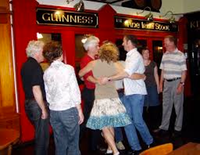 �You can travel almost anywhere in the world and meet Irish Set Dancers at classes, ceili's, worshops, and festivals worldwide. What is Irish Set Dancing? Set Dancing is a form of social dancing, which has been enjoyed in Ireland for over 150 years and has seen a recent huge revival in Ireland and in Irish communities throughout the world. 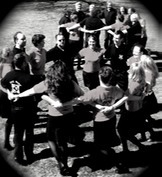 "Sets" are danced by eight people in a square formation. �Each set consists of three to six figures with a short pause between each. �The figures are danced to reels, jigs, hornpipes, polkas, and slides. The basic footwork can be described as a low 'sliding' movement. �There are many different styles, from basic steps to very elaborate battering steps. �Just enjoy your own 'style' and have fun! "Sets" are descended from quadrilles danced at the French courst in the late 18th and early 19th centuries and other related dances from Scotland, and elsewhere. �They were brought to Ireland and the early Irish dance masters adapted them to Irish traditional music and elaborated them to form dances with great drive and enjoyment. 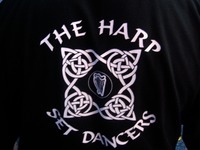 Why are you called The Harp Irish Set Dancers? Trish and Alarna called their set dancing group the Harp Irish Set Dancers. �The Harp is the national symbol and treasure of Ireland, an integral part of Irish history, life and culture, an emblem of ireland, & Ireland is the only country with a musical insturment as its national symbol. �The harp is an integral part of Ireland's mystical storied past. �Irish myth and legend attributes the Harp to the Tuatha De Dannan, the ancient fairy race of Ireland. 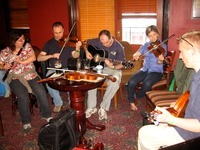 Ireland is the only country with a musical insturment as its national symbol. �The harp is everywhere, on the back of Irish coins, government documents, and on every pint of Guinness. �It's the official national symbol of Ireland, not the shamrock. But most importantly Alarna loves and plays the Harp. THe Harp has been an important emblem of Irish nationalism since the 10th Century. The Trinity College harp, one of Ireland's national treasures, is the harp from which the national symbol or Ireland is copied. �The characteristic shape of an Irish Harp is familiar from Irish coins and bottles of Guiness. �For centuries, the harp was an integral part of Irish life. �Traveling harpists in Ireland, such as Turlough Carolan (1670-1738), the blind Irish folk harpist, wrote hundred of tunes - many of them still popular today. Long associated with a rich cultural heritage of the Irish people, the harp graces the presidential flag, Irish coins and is even the official label of Dublin's own Guinness stout. �In days of old, Irish chieftains and kings commissioned Celtic harpers and bards to chronicle their great feats in epic poems. �Irish harpists were revered and respected members of Medieval Irish society. �Irish myth and legend attributes the Harp to the Tuatha De Dannan, the ancient fairy race of Ireland.